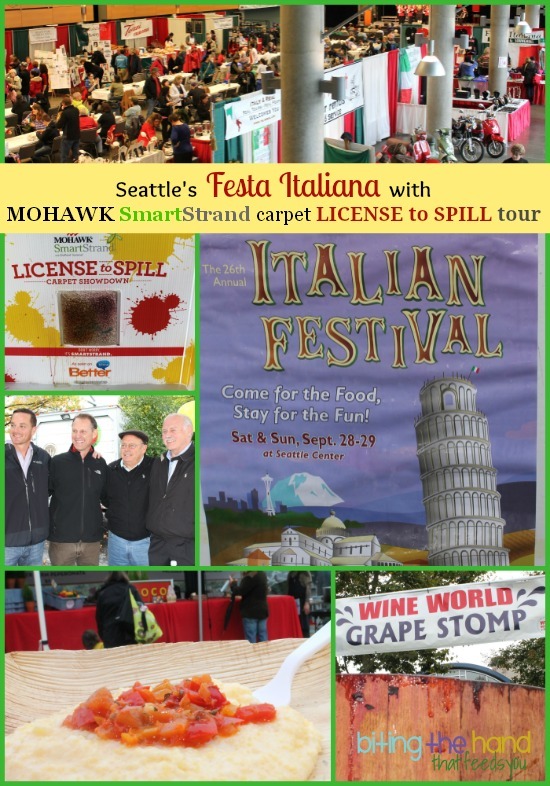 This weekend I ventured out in the torrential downpour rain to Festa Italiana in Seattle, with Mohawk Flooring and their "License to Spill" tour, to check out their SmartStrand stain-resistant carpet. Hubby had wanted to stay home and clean the house, so we compromised and I dropped the kids off at Nana's so he could concentrate on cleaning, and I could get drenched check out the Italian festival! Naturally I found the parking lot furthest away from where I needed to be, and also the most expensive one - I was paying $7/hour... and walked past two closer covered lots that were only asking $9 for the whole day! Doh! Thank goodness I had an umbrella in the car! I did a lot of schlepping around in the rain; from the parking lot to Seattle Center, then all around trying to find where the festival was located (I apparently walked three sides of the large mall-building it was outside of... on the fourth side!) And I hadn't eaten lunch yet. So I was hungry. There were loads of Italian restaurants represented there, and guest chefs with free samples and food for sale... only there aren't a lot of gluten-free options in Italian cuisine! Pasta and pizza, capisce? I was able to try the Porchetta with Polenta and Pepperonata from Chef Matt Fortner of Cuoco, which came highly recommended, except they couldn't guarantee that the pork rub was gluten-free. So I had just had the "veggies" (the polenta and their bell pepper-tomato topping.) And they were very good! Other than the food booths and demo events, the only other stuff outside was a car dealership (either Fiat or Ferrari, I can't remember. Both are Italian and start with an "F!" And they were kind of down some stairs and behind a building) and the Mohawk Flooring License to Spill booth. Mohawk is the world's largest flooring manufacturer, and their beautiful flooring products are available through authorized retail partners. People were encouraged to test the softness and cleanability of the SmartStrand carpets for themselves. 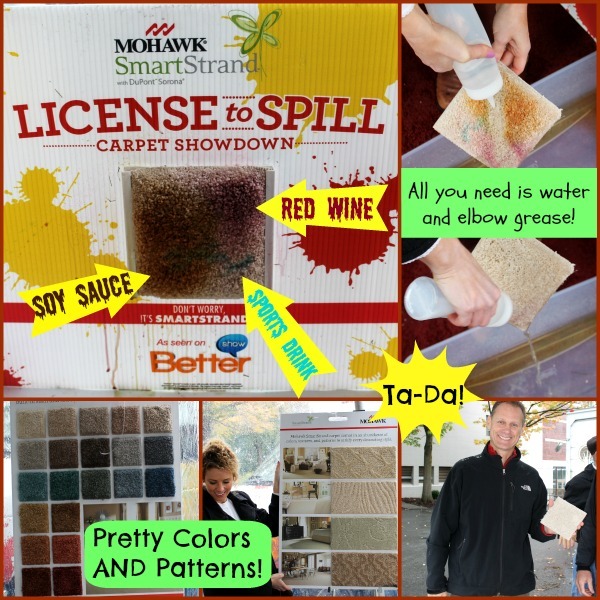 The Mohawk booth had spray bottles of soy sauce, blue-dyed sports drink, and red wine for you to stain your own square of carpet. Since I knew I wouldn't be spilling sauces or wine in nice light spritzes, I went to town spraying them each in one area to get it more saturated. As you can see below, they washed right out! Carpeting and installation are such a large investment of time and money - you'd kind of expect them to stay nice looking longer than they do, am I right? Most carpets have a stain resistant coating on the outside of the fibers, that wears off over time due to foot traffic and other wear and tear (have kids or pets, anyone?) But with SmartStrand stain-resistant carpet, the stain protection is permanent - built right into the carpet fibers! I've been slowly replacing chemicals in my home with less harsh, more natural products. Cleaning products are the hardest to replace though, not only to find something effective, but also to find something compatible with, say, your steam cleaner! But with SmartStrand, you don't need to use any harsh chemical or carpet cleaners to remove stains! All you need is a rag, some warm water, and a mild detergent, like dish soap - even tough stains like ketchup [ohhh, how I hate ketchup mishaps!] brightly dyed kids drinks [no longer a danger in MY house, thank goodness!] and even red wine [which I would totally need if my kid was still drinking the dyed stuff!] will clean easily out of SmartStrand carpet! It's no wonder this carpet is rated #1 in customer satisfaction! With SmartStrand carpeting, your kids can be totally "licensed to spill!" I also found out that SmartStrand is 37% renewably sourced plant-based fibers (corn) instead of more limited petroleum. [Who knew carpets were made from petrol? Gross! I wonder if my petroleum-sensitive child and I are affected by this...] And the production of Sorona polymer (which SmartStrand is made from) uses less energy than nylon production. In fact, the energy equivalent of one gallon of gas is saved for every 7 square yards of carpet made! Plus fewer fumes released when installed, since less of the carpet is artificial! * And this carpet is so soft! Durable, stain-resistant, and soft carpet? Win! *based on what I remember from what the guys said. I guarantee nothing. Want to win your own 6'x9' SmartStrand Silk bound carpet rug? Click here to enter! And be sure to check out Mohawk Flooring on Twitter and Facebook for deals and updates! After testing the stain resistance of the SmartStrand carpeting, I tested the stain-resistance of my feet! 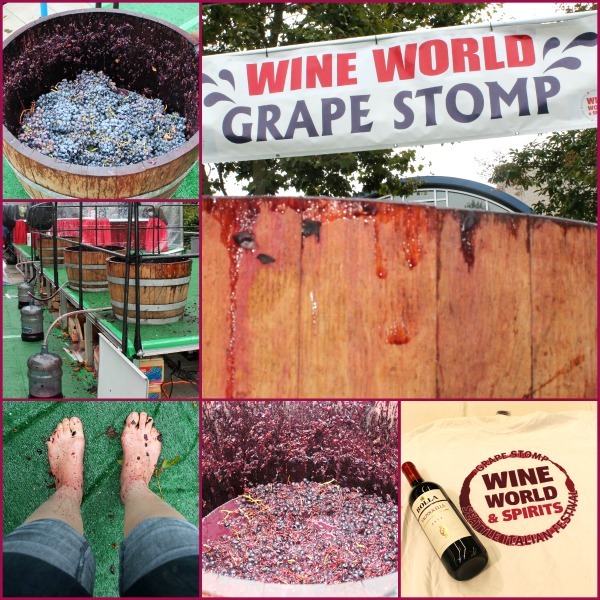 No Italian festival is complete without stomping grapes to make wine, am I right? So naturally I was intrigued when I heard the call for volunteers for the Grape Stomping contest. The announcer had me at "everyone wins a prize" but almost lost me at "and you'll be on TV!" Luckily, my greed almost always outweighs my shyness! We were in groups of three, and one of the guys with the Better TV crew, on their Better Tour, was on an opposing "team." Each team member took turns stomping grapes for one minute, while the other team members worked to clear the opening to the hose to let the juice out. The team with the most juice (more like pulp! Haha!) won.